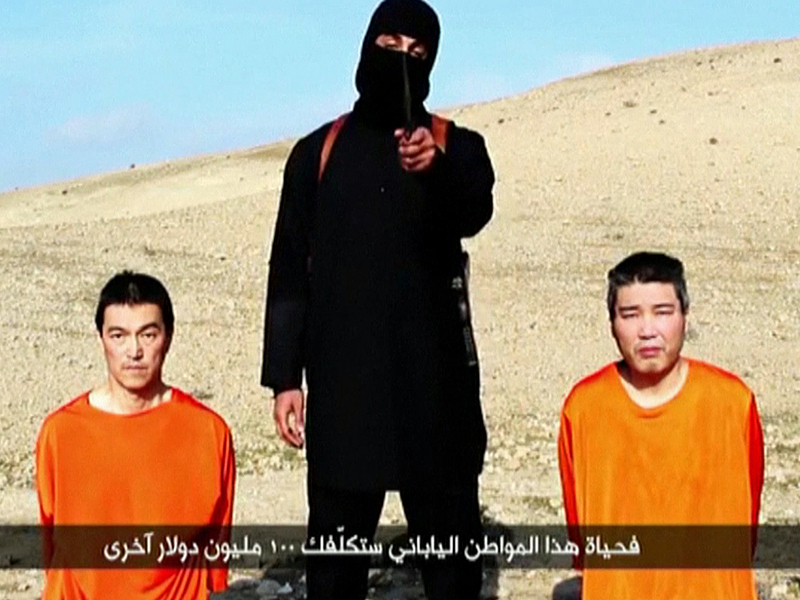 CAIRO -- The Islamic State of Iraq and Syria (ISIS) threatened to kill two Japanese hostages unless they receive $200 million in 72 hours, directly demanding the ransom Tuesday from Japan's premier during his visit to the Middle East. Prime Minister Shinzo Abe vowed to save the men, saying: "Their lives are the top priority." Abe and other Japanese officials declined to discuss whether they'd pay the ransom for captives Kenji Goto and Haruna Yukawa, though their armed forces generally only operate in a self-defense capacity at home. Their kidnapping also immediately recalled the 2004 beheading of a Japanese backpacker in Iraq, carried out by ISIS' predecessor over Japan's involvement in the U.S.-led war there. CBS News could not independently verify the authenticity of the video, but it carried the insignia of ISIS' official media arm, al-Furqan, and was posted on ISIS-affiliated websites. Japanese officials said they would analyze the tape to verify its authenticity, though Abe offered no hesitation as he pledged to free the men while speaking to journalists in Jerusalem. "It is unforgivable," said Abe as he wrapped up a six-day visit to the Middle East. He added: "Extremism and Islam are completely different things." In the video, the two men appear in orange jumpsuits with a rocky hill in the background, a masked militant dressed in black standing between them. The militant in the video looks and sounds identical to a British man involved in previous ISIS beheadings known colloquially as "Jihadi John." The scene resembles others featuring the five hostages previously beheaded by ISIS, which controls a third of Iraq and Syria. "To the prime minister of Japan: Although you are more than 8,000 and 500 kilometers from the Islamic State, you willingly have volunteered to take part in this crusade," says the knife-brandishing militant. "You have proudly donated $100 million to kill our women and children, to destroy the homes of the Muslims ... and in an attempt to stop the expansion of the Islamic State, you have also donated another $100 million to train the (apostates)." The militant's comments likely refer to money Abe pledged while in Egypt to help Iraq's government and aid Syrian refugees. The British-accented jihadist also appeared in the beheading videos of slain American hostages James Foley, Steven Sotloff and Peter Kassig, and with British hostages David Haines and Alan Henning. Abe said he would send Yasuhide Nakayama, a deputy foreign minister, to Jordan to seek the country's support and to resolve the hostage crisis. The premier also said the Israeli government, which Japan promised Sunday to cooperate with on counterterrorism, are sharing information to aid in the hostage crisis. The Israeli prime minister's office declined to comment. "If true, the act of threat in exchange of people's lives is unforgivable and we feel strong indignation," Suga told journalists. "We will make our utmost effort to win their release as soon as possible." Yukawa, a 42-year-old private military company operator, was kidnapped in Syria in August after going there to train with militants, according to a post on a blog he kept. Pictures on his Facebook page show him in Iraq and Syria in July. One video on his page showed him holding a Kalashnikov assault rifle with the caption: "Syria war in Aleppo 2014." "I cannot identify the destination," Yukawa wrote in his last blog post. "But the next one could be the most dangerous." He added: "I hope to film my fighting scenes during an upcoming visit." Nobuo Kimoto, an adviser to Yukawa's company, told Japanese public television station NHK that he had worried "something like this could happen sooner or later." "I was afraid that they could use Yukawa as a card," Kimoto said. Goto, 47, is a respected Japanese freelance journalist who went to report on Syria's civil war last year. "I'm in Syria for reporting," Goto wrote in an email to an Associated Press journalist in October. "I hope I can convey the atmosphere from where I am and share it." ISIS has beheaded and shot dead hundreds of captives - mainly Syrian and Iraqi soldiers - during its sweep across the two countries, and has celebrated its mass killings in extremely graphic videos. Japan's military has been constrained by the country's commitment to pacifism in the constitution drafted during the American occupation following World War II. Abe is seeking to raise Japan's military capabilities and expand its reach, but he has ruled out sending troops overseas. It remains unclear whether Japan would ask the U.S., which has launched previous operations to free hostages in Syria, to attempt a rescue. Tuesday's video marks the first time an ISIS message publicly has demanded cash. The extremists requested $132.5 million (100 million euros) from Foley's parents and political concessions from Washington, though neither granted them during months of negotiations before his killing, U.S. authorities say. ISIS has suffered recent losses in airstrikes by a U.S.-led coalition, and with global oil prices being down, their revenue from selling stolen oil likely has dropped as well. The extremists also have made money from extortion, illicit businesses and other gangland-style criminal activity. Its militants also recently released some 200 mostly elderly Yazidi hostages in Iraq, fueling speculation by Iraqi officials that the group didn't have the money to care for them. Japan relies on the Middle East for most of the crude oil it needs to run the world's third-largest economy. It also has been working to build wider economic ties in the region, like with Abe's current Mideast tour. This is Abe's second Mideast hostage crisis since becoming prime minister. Two years ago, al-Qaida-affiliated militants attacked an Algerian natural gas plant and the ensuing four-day hostage crisis killed 29 insurgents and 37 foreigners, including 10 Japanese who were working for a Yokohama-based engineering company, JCG Corp. Seven Japanese survived.